Today I'm highlighting what I think is one of the best contemporary mod bands. In fact, they're good enough to rank right up there with any of the great mod bands of the mod revival, which their sound most echoes. 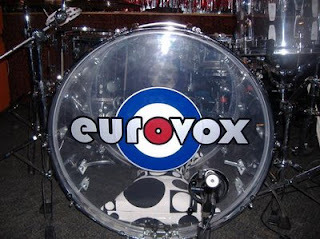 Eurovox is a British band that followed in the footsteps of the London Bridge and moved themselves lock, stock and vox amp from the UK to Arizona in the desert southwest of the USA. That makes them the best mod band in Arizona today. Or for that matter, the best mod band anywhere today. No joke. Just check out their second LP, the 2007 released "Now...Here...This" which is the total package. Not a bad song in the bunch. Following on the heels of 2005's "This is... Eurovox", this album bursts forth with pounding power pop. The songs drive hard, and are fast and furious in both their delivery and their sense of action. It's one hard punch after another until you really do feel you've been aurally pummeled, but in such a good way you end up wanting to be pummeled over and over. Check out more cool tracks on their myspace page, and pick up their second release here. Thier track is "A Night on the Tiles" and is one hell of a mod piece of power pop. The ringing guitars, the driving drums, and some great lyrics make for a song that will take you back to '79 and at the same time leaves you thinking that this is one fresh band. Update: Sadly, Eurovox have broken up.